The Namur World Cup course will be tackled by the world's best again on Sunday December 21st. We begin our build-up by taking you around the famous Citadel in the off-season. Words & photos: Konrad Manning. THE Namur Citadel venue is a favourite here at Cyclocrossrider for both the technical nature of the circuit and the dramatic fortress setting. Ahead of the World Cup we'd like to show you around the Namur Citadel via a gallery of photographs that we took one early morning earlier in the year. The course may not be too recognisable outside of race day but some of the features are easy to find. One thing that did surprise us was that the ruts created on the long off-camber straight descent - with hidden roots - that is a famous feature here were still there deep in the grass and baked hard in the summer! The start line is down on the cobbles below the 'parade ground' and the riders charge up towards the hairpin before going straight on and up the narrow track towards the Chateau. Belgian Under-23 champion Jens Adams describes Namur as one of the toughest courses on the European pro circuit: "This of all the major races has the most altitude differences. There are hard, long climbs followed by technical descents. It's also has the beautiful surroundings of the citadel high above the city," he says and places Namur in his 'Six of the Best' parcours here. 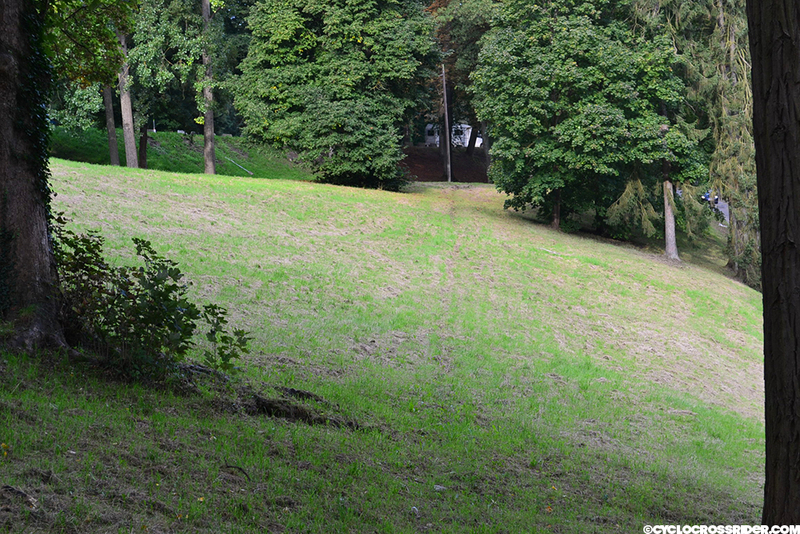 Around the back of the Chateau is this bare earth climb before the riders cross the parade ground and pass the pits. Belgian-based American Christine Vardaros has raced Namur many times and told us that the nature of the course can strike fear into some riders. "I was already hooked on this race well before it became a World Cup," says Christine, "It was more like a mountain bike race back then with crazy steep, long and treacherous, singletrack descents where you just had to pray to the gods that you'd make it to the bottom in one piece. Cyclocross brakes really weren't enough to even slow you down against terrain like that back then. Nowadays, the course includes only three super short steep descents that still manage to instill fear in most racers - some refuse to ride down them, opting to go on foot." Christine also names Namur as one of her six favourite courses here. This steep banking looks fairly innocuous in the summer but come race day climbing up it is very hard (and a run-up) and descending back down to the right is treacherous. Namur (or Namen in Dutch) is an ancient city at the confluence of the Meuse and Sambre rivers in Belgian Wallonia and the origins of the citadel perched high above the city date back to 937. Much of the impressive fortifications was built between 1631 and 1675, when the city was under Dutch control and it was named "Terra Nova" to differentiate it from the smaller fort built in 1542. Since 1986 Namur has been the capital of Wallonia and the Walloon Parliament is based at the foot of the citadel's slopes. It's been a dark and dismal winter's week across Wallonia and rain is falling steadily today (Friday) which should ensure that the course is it's usual slippery self on Sunday. There will be a live UCI feed of the racing on Sunday so if you are not familiar with Namur you can watch and see what all the 'fuss' is about. From the steep banking (now in the right far distance) the riders come to this telegraph pole before turning 180 degrees to face the famous off-camber descent (below). Looking back up the descent to the telegraph pole - this is where some of the best television images come from.